In the late 1790s the young republican France had defeated Austria in Italy and, with the ever more powerful general Bonaparte, contemplated an invasion of the old enemy - Britain. Without the necessary naval superiority this proved unfeasible, so an invasion of Egypt, nominally at least part of the Ottoman Empire, was executed instead (in 1798) with a view to disrupt Britain’s links with India and ultimately deprive her of that extremely important possession. Although the French succeeded in conquering Egypt, Ottoman counter-attacks and, crucially, British naval victories such as Aboukir Bay meant the French had great difficulty holding their new prize, and in 1799 Napoleon abandoned the army and returned to France. The French held on during 1800 but in March of the following year a British force landed in Egypt and within six months they and the Ottomans had forced the French to surrender. In a change from our usual format we will begin looking at this set by considering the box rather than the contents. The title, 'British Army in Egypt 1800', is a nonsense as there were no British troops in Egypt in 1800, as we have said. The next line states the contents include the 60th regiment and the 13th Bombay Sepoys Regiment. This too is nonsense as the 60th Regiment, despite having no less than six battalions, served exclusively in America at this time and never set foot in or near Egypt. The reference to the 13th Sepoy Regiment is, well, nonsense, as this regiment ceased to exist in the late 1790s as a result of the 1796 reforms, becoming instead the second battalion of the 1st regiment. However, all is not lost because, despite what the label might say, the manufacturer has in fact made British troops suitable for the 1801 Egyptian campaign, so now we must discard the box and assess what really matters - the figures. To begin with we will consider the European troops, which are the first six pictured above. They wear fairly standard uniforms for British troops of the period with one obvious exception: the 'Tarleton' helmet. This peaked leather cap with the crest had long been associated with light troops, and in the Egyptian campaign only one infantry regiment wore them: the 90th (Perthshire Volunteers) Regiment of Foot. This was indeed a light infantry regiment, and they participated in the whole operation, although unfortunately there is some evidence, admittedly unconfirmed, that the men replaced their Tarletons for the more comfortable round hat during the campaign. Nevertheless the men are dressed correctly, and carry a haversack, canteen and bayonet scabbard as you would expect. Three have a knapsack, while a fourth man has a blanket rolled diagonally across his back and a fifth does without. When the initial landings were made the knapsacks were left on board ship, and for a while the men fought with just the rolled blanket, so these figures represent the different stages of issue during the fighting, although it is easy to imagine men with different levels of kit serving side by side. To our eye the muskets seemed a little short, but as lights these men may well have been using the shorter India Pattern musket, and the length is correct for this weapon. The officer is nicely and correctly done as he wears standard British officer uniform including double-breasted coatee and sash tied at the left, while he correctly carries a curved sabre. Again the Tarleton is OK but could easily be substituted by a round hat or bicorn. When London decided to intervene in Egypt it made a request to the Governor-General in India to contribute a force of 5,000. This duly sailed from Bombay in March 1801 but despite a gruelling march only arrived in time to participate in the later stages of the campaign. Part of this force under Sir David Baird consisted of native sepoy infantry, specifically the 2nd/1st Bombay Regiment, the 1st/7th Bombay regiment and a composite Bengal volunteer battalion, all from the army of the Honourable East India Company of course. Unfortunately sources seem to contradict each other as to the uniform of these men, and as the uniforms of the Bombay and Bengal armies often differed anyway it is hard to be sure of their appearance in Egypt. The six poses in this set follow the image shown in several reference books, with a puggree wound round a frame as a sort of turban, a standard European coatee and jangheas (breeches or shorts) with a form of dhoti round the waist and between the legs. These men might be barefoot or wearing sandals - both are valid but it is hard to make out here. All the men wear the same belts and kit as their European counterparts, including haversacks, bayonets and canteens. They should be armed in the same manner, and appear to be so, although one man has also acquired an interesting curved sword. Given the lack of solid evidence all these sepoys seem fine to us. All the poses for both troop types seem well chosen and pretty well executed, although having the same number of every pose is not ideal for many people. There is nothing flat about these figures, and while the detail is not sharp or clear in many cases the limbs are actually pretty slim and the proportions well done. If not works of art they are at least pretty decent and certainly fit for purpose. There is also no flash, and as the figures do not come on a sprue it is only necessary to remove one piece of plastic from below the base to make the figure ready for use. However it should be pointed out that great care needs to be taken with these figures as they are produced in a very soft plastic that will not withstand rough handling. Recently GerMan/BUM have started using a new material, which is better but still not particularly strong, but we do not know if this particular set is available in the new material. 24 figures is not a lot by modern standards, but the set also includes the diorama piece shown in our bottom row. This is made in a very hard plastic and is a wonderful little model. 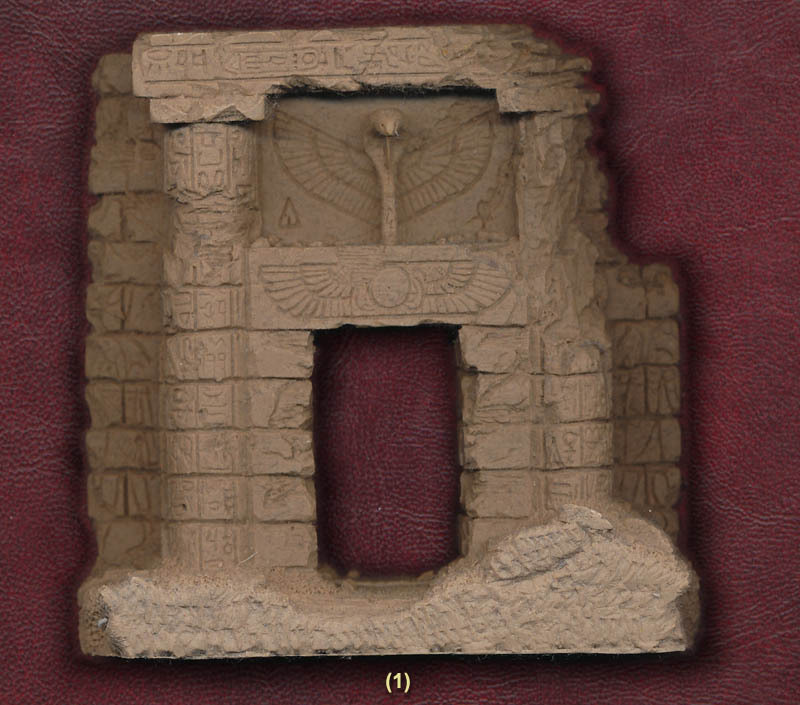 It shows a doorway somewhat damaged but covered in hieroglyphs and pictures as if from ancient Egypt. At almost 9cm tall it is plenty big enough for the figures and makes a fantastic backdrop for them, although whether it is accurate in terms of ancient Egyptian architecture we have no idea. This model was originally made by Grendel as a fantasy piece, but looks good enough to us to pass as historically appropriate. The set also includes some paper flags, being those of the 60th Regiment (so not much use here), the East India Company itself and generic Kings and regimental colours. At a time when many producers are playing safe and making sets on mainstream subjects already well covered, GerMan are to be congratulated for making something so unusual and interesting. Splitting the set into two troop types limits the number of poses for each, yet avoids the bulk of the British infantry by only providing light infantry and sepoys. As a result this is a set crying out for one or more sister sets for this very underrepresented campaign, since as a depiction of the British Army in Egypt it barely scratches the surface. However the figures themselves are pretty good and we can only hope that more is to follow, hopefully in a more robust plastic! Note: Given that we have rubbished the description given to this set we could have addressed the accuracy score in one of two ways. As a representation of the 60th regiment in Egypt in or around 1800 the set should score zero as there was no such thing. However we have chosen to be kind and rate the accuracy based on the appearance of the 90th Foot and sepoys in Egypt in 1801, effectively ignoring the description on the box.